Cosy, charming and friendly, the Capri Hotel in Puerto de Pollença will bring you directly to a unique world full of calmness and wellness: a small boutique hotel in front of the pedestrian promenade of Puerto de Pollensa, at the beachfront, where you can design your holidays in the north of Majorca you have always dreamt of. 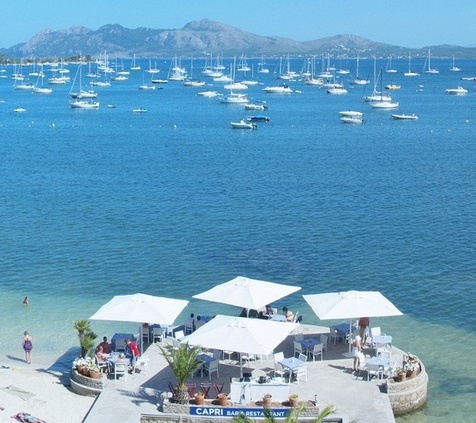 The Capri Hotel, only for persons older than 12 years, offers you comfortable spaces, terraces with incredible views to the bay of Pollensa, personalised attention and an exclusive pier for the breakfasts of the hotel guests. Book your hotel in the Puerto de Pollença at the best price guaranteed on the official website of Capri Hotel. The hotel is in the pedestrian promenade of the Puerto de Pollença. Only 10 metres away from the beach. Enjoy an exclusive terrace above the sea on a pier, for romantic dinners and sunny breakfasts. Connect to Internet and share the incredible images of your holidays in Pollença. To know everything that happens on social networks and get great discounts. 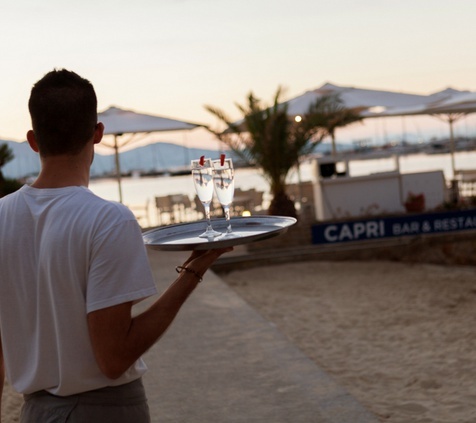 According to Law 15/1999, of December 13, Protection of Personal Data, any information exchanged by the following means will be treated confidentially and will be unique and exclusive use of Hotel Capri to managing the services offered. Hotel Capri is not responsible for interruptions or errors in accessing the website or technical problems when connecting to the Internet. Likewise, can not guarantee the absence of viruses or other electronic documents in the system, which excludes any liability for damages that they could cause to the users. Hotel Capri is not responsible for hyperlinks that link to our site included on third party websites or liable, under no circumstance, for the legality of the content, this being the third party liability. Those who use the name of Hotel Capri in third party sites should ensure that they only allow access to the Hotel Capri web page and do not contain inaccurate or incorrect information about the contents of them. It also prohibits the use of distinctive logos of Hotel Capri in the links that are placed. All intellectual property rights of this website and its elements are part of Hotel Capri and prohibited any total or partial reproduction without prior, express written permission of the Manager of Hotel Capri. Hotel Capri reserves the right to modify and update this information at any time without notice.